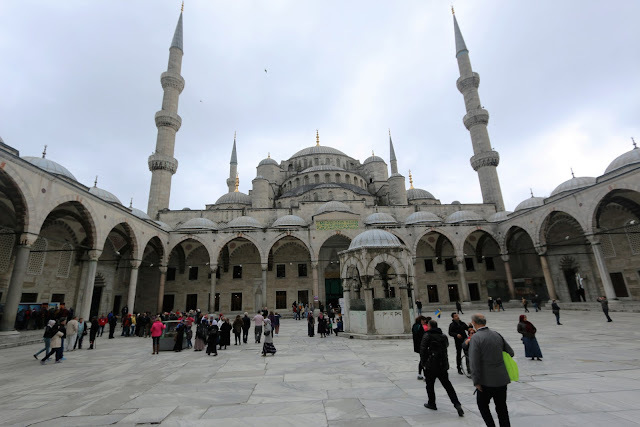 Staying within Sultanahmet Square in Istanbul, Turkey helps us a lot in saving time and money on public transportation. Most of popular tourist attraction sites are located within short walking distance in Sultanahmet Square. Istanbul is famous for its worse road traffic conditions during peak hours in the morning and evening every day so, it's not advisable to stay too far from the attraction sites which require to travel by public transportation. As I mentioned in the previous posts, we stayed in Sultanahmet Square for three days before moving to another hotel near Taksim Square in Istanbul. It is a good experience staying in Sultanahmet Square (the old city which is famous for historical attraction sites) and Taksim Square (the modern city for shopping, restaurants and bars). On the way to Grand Bazaar or also known as Kapali Carsi (covered Bazaar), we saw the historical wall which was well-maintained in Sultanahmet area. You would be able to see this historical wall as you are coming from the international Airport to Sultanahmet area. There are more than 4,000 shops selling jewellery, textile, souvenir, traditional Turkish hand made ceramics, lamps, spices, sweets etc. at Grand Bazaar. Grand Bazaar is famous with more tourists than locals as the prices are more expensive than you can find in the local market. It is an eye-opening to visit Grand Bazaar but it's not recommended to shop there. 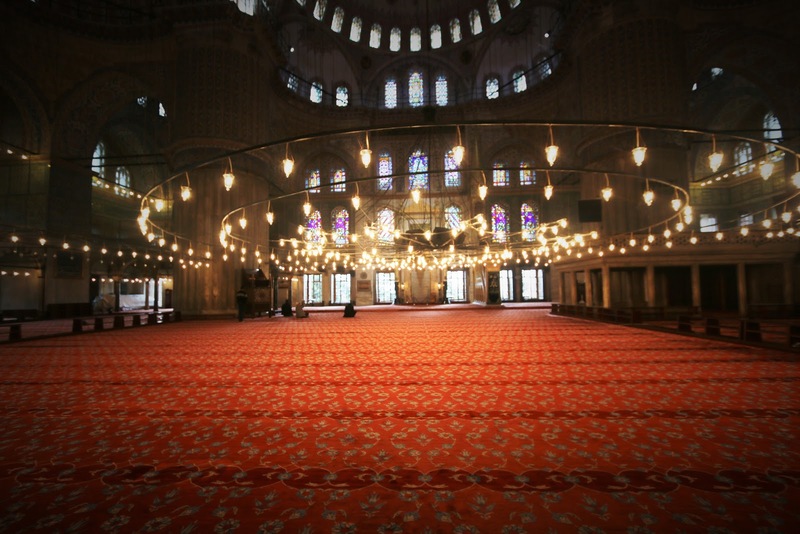 2) 15 minutes walk from the Aya Sofya/Blue Mosque area. 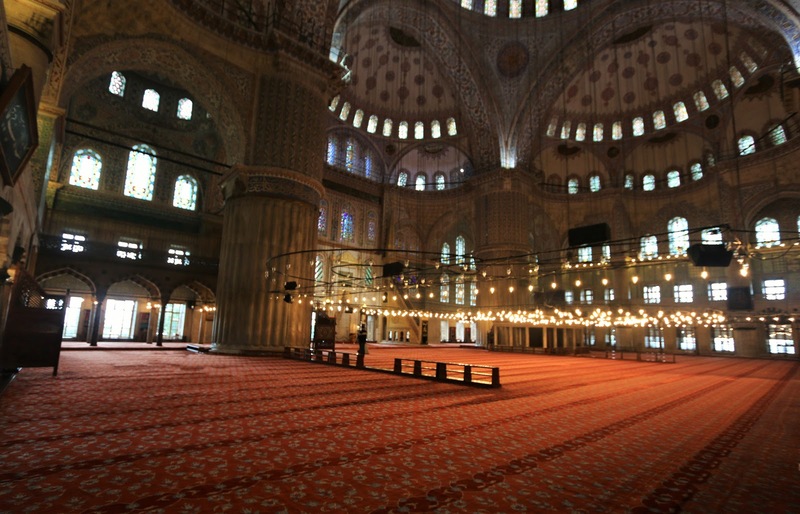 Sultan Ahmed Mosque or also known as Blue Mosque is a very popular attraction among tourists. Blue Mosque is situated right opposite of Hagia Sophia in Sultanahmet Square. You will find long queue since early in the morning heading into the Blue Mosque. There is strict dress attire to adhere for men and women. - Cover your hair and neck with your scarf. Recommended to carry your scarf around during your trip to Turkey. - To ensure your clothing covering your shoulder up to your elbow as well as covering your legs (up to your feet). - Recommended to wear long sleeve shirt/blouse with long skirt or long jeans. Legging and hats aren't permitted in the mosque. - To ensure your shirt covering your shoulder up to your elbow and long pants beyond your knee. - Recommended to wear long pants or long jeans during your visit to Mosque. 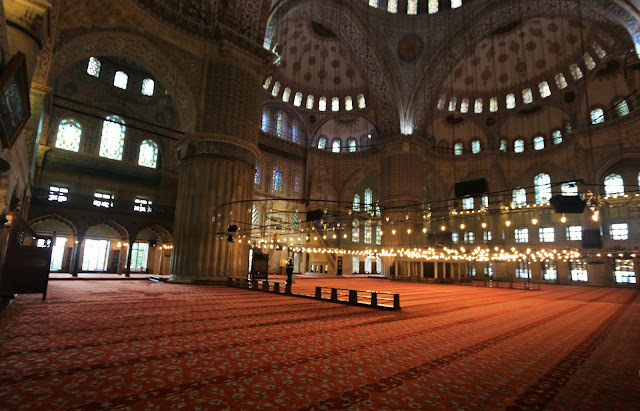 Blue Mosque is popular known for its beautiful interior architectural design. High ceiling is lined up with 20,000 blue tiles from the 16th Century Iznik design (the oldest tiles featuring flowers, trees and abstract patterns). The high ceiling is lit up with 260 windows which were once filled with 17th-Century stained glass but they were lost. The windows are replaced with replicas.